The Safari Table Animal Chairs is a colorful and unique table-and-chair set created specifically for children. This set offers a fun environment for children to develop their imagination and is useful for activities. 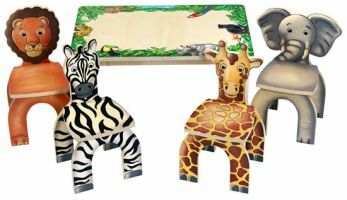 Whether it be used for drawing or playing, the Safari Table Animal Chairs is a great addition to any children’s area! Ages 3+.